Let's start with the basics. You'll always need a camera device, microphone, and lights. Always. As of right now, I'm shooting my vlogs with an iPhone 8s, iPhone 6, a Neewer condenser mic, an iRig, and a ring light. Aesthetically, my vlogs could look better and I know this. I see the grain in my video as well as some pixelation and it does bother me, but I know that good looking video takes a backseat to great content and storytelling. So, I don't let it get to me...yet. Warning: The word "iPhone" is mentioned a lot in this article. If the word iPhone offends you, please substitute it with "Android" or "smartphone." Here's what I recommend when first starting out: shoot cheap. Shoot either on your smartphone or a point and shoot camera that's at least 8 megapixels. Less than 8MP starts to look pretty bad on desktop computers. If you don't care about how it looks on a desktop then don't shoot less than 6MP for smartphone devices. People will tolerate grainy, pixelated video up until a certain point. Don't give them a reason to click away! Keep in mind that even if you don't have a ton of money to invest in a great camera, there are some post-production tricks that you can use in Final Cut Pro or Premiere Pro that may clean up your video a little bit. But as the old saying goes, "You can't polish a turd." Basically, if it looks like crap when you shoot it, the finished product isn't going to look that much better! If you're recording directly into your iPhone, you'll probably need a device called an iRig. It's a little box that has an XLR input (mic input) and a 3.5mm mini cable (headphone plug) so you can connect to a camera or an iPhone with a Lightning adapter. If you buy a condenser microphone, you'll also need this thingymajig because it has a little something called phantom power which literally powers up your microphone. Read this again! If you buy a condenser microphone it will need a device to give it 48V phantom power! Just buy an iRig and call it a day. I use a cheap condenser mic, specifically the Neewer NW-800, for my vlogs. It got great reviews on Amazon and hasn't posed any problems as of yet. While audio accounts for 50% of your finished product (video making the other 50%) I would suggest finding something under $100 because there is plenty to choose from of decent quality. That is unless you want a mic that's encrusted in diamond. Otherwise, stay basic. Handheld recorders, like a Zoom H5 (which I own) are very helpful for recording on location audio. It has 2 XLR (microphone) inputs so you could connect up to 2 different mics. It also has multiple attachable accessories for different recording scenarios (live music, interviews, vlogs, etc). I made the mistake of starting of too cheap for lights and I ended up spending more than I should have for a decent setup. I had 2 LED panel light boxes to start with. I used one as a key light (directly in front of my face) and one to light the background. After a year, one panel died (cue the sad music). The lights didn't really light my face evenly, nor did they do me any favors in reducing the appearance of blemishes or wrinkles. Damn them to hell! So I opted for a single ring light instead. It's great and it really accentuates the eyes. 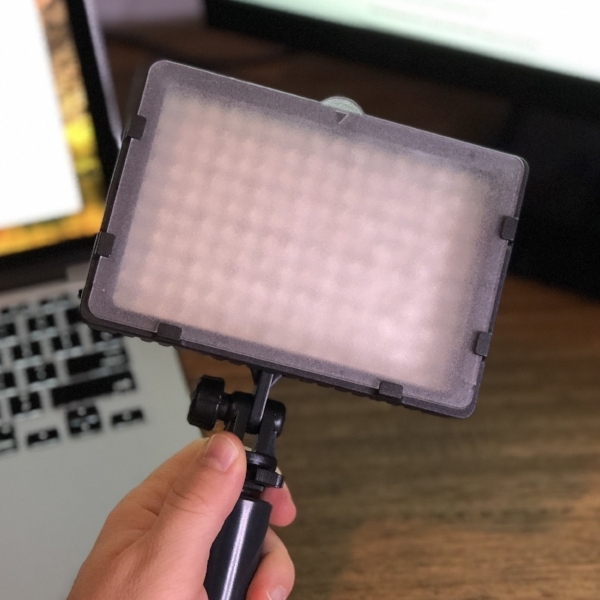 I highly recommend getting one for your vlog. There's a new light on the market that is also fairly cheap and getting great reviews. While I haven't used one personally, my coworker has an he was amazed by the quality at the low price. Check it out here. What I know is that good lighting makes the difference between an amateur looking video and a professional one. Spend a little more money in this department to get a decent setup. You'll notice most vloggers utilize at least one ring light and some extra lights to fill in the background for ambiance. I'm not saying go that far yet, but it's definitely a good option to consider down the road. If you plan on using your iPhone to perform the bulk of the video recording, I would highly suggest a good mount. The last thing you want to happen is to have your $1000 phone drop out of your cheap mount, crashing to the ground. Prevent a potential heart attack and invest in a decent hot shoe smartphone mount. I paid $13 for my Charger City mount. Worth every single penny! Another accessory that I use quite often is my Joby Gorilla flexible tripod. It's a good thing to have around when you need to shoot something steady, plus it fits easily in any backpack. I keep mine on me whenever I leave the house. Like the Boy Scouts say, "Be prepared." I'm no Boy Scout but I do like their motto. Lastly, I bought a Movo Timelapse tripod head to get some cool cut away shots. Admittedly, I've only used it once and thought it was really cool. In the right application, it will be a great thing to have. That application hasn't presented itself yet, but I'll continue to play with it anyway until it does. Come to find out, viewers have little patience for anything overly cinematic or artsy when they just want to see a tutorial or equipment vlog. Go figure! So, let's tally up all of the costs for the equipment mentioned above to have a cheap, but decent vlog setup. While $1,241 may seem like a lot to some people, it's really not, especially considering that a mid-level camera sells for more than that. Basically, you can set yourself up for less than that cost of a half-way decent camera. I'd say that's a success. The real challenge now comes with creating ideas for your vlogs and actually executing them. It take a lot of time to edit something together. I spend at least 8 hours editing together a 5 minute video. I would say that I'm an average editor, both on skill and knowledge, and if you have little know-how on editing then you'll need to budget more time into your post production. Remember, shooting is the "fun" part. Editing is the behind-the-scenes back breaking part. Hopefully, I'll see some of your stuff soon. If so, tag me and let me know what your setup is. I'd love to hear more about it!